An immensely popular UK production, now with 20 extra stories, four CDs with full story narration, new illustrations with all the warmth and appeal of the originals, and an appendix of tips for storytelling. About "The Lion Storyteller Bible"
The Lion Storyteller Bible broke new ground in its presentation - both verbal and visual - of Bible stories. It has been immensely popular, with sales in the UK exceeding 130,000 copies and editions printed in more than 11 languages. 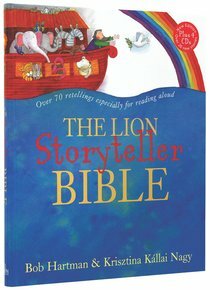 Since The Lion Storyteller Bible was first published Bob Hartman has established an international reputation as a storyteller and writer.This new book integrates more than 20 new Bible story retellings with the 50 tried and tested originals. It also includes a useful appendix of Bob Hartman's hints and tips for storytelling, as well as 4CDs on which the stories are narrated by voiceover specialist, David Holt. Newly commissioned illustrations throughout will capture as much warmth and appeal as those in the first edition.